Iron Mike was the star of "Mike Tyson's Punch-Out." 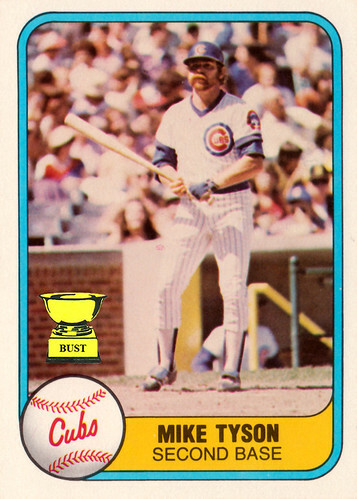 You didn't need to be a star to punch out baseball Mike at the plate. Iron Mike's bicep measured 16 inches. Baseball Mike's boiler was more than triple that. In his free time, Iron Mike likes to care for pigeons. Baseball Mike's only friend growing up was a yellow parakeet named Butter. Iron Mike has a tattoo on his face. Baseball Mike appears to have a marmoset on his face in the above photo. Iron Mike once said he wanted to eat an opponent's children. Baseball Mike once ate four boxes of Sour Patch Kids in one sitting. Iron Mike starred in a short-lived reality series on Animal Planet called "Taking on Tyson." Baseball Mike watched a couple of episodes on his couch.